Another late one for you, this is from last November. It’s coming up to winter training time again, just Relentless left for me now, unless I do something really, really stupid, like enter the Stathpuffer. Winter is generally rather cold and wet so if I’m going to be racing in the winter I might just as well embrace the cold and wet and go for it. My former house-mate Pete had decided that it would be a good idea to try one of those running/obstacle course races which seem to be getting increasingly popular and had selected The Suffering at Rockingham Castle for us to try. I had done a couple of these before, The Hellrunner at the end of 2011 where I came twenty-somethingth and then The Legends of Sherwood, which was similar but in the dark, in early 2012 where I had been really pleased to come third. However, since then I had fractured my kneecap and had barely run at all in the following two years, it would be interesting to see how I would get on. One thing I had remembered is how important it was to get a good start and miss the crowds which would form at the first few obstacles. 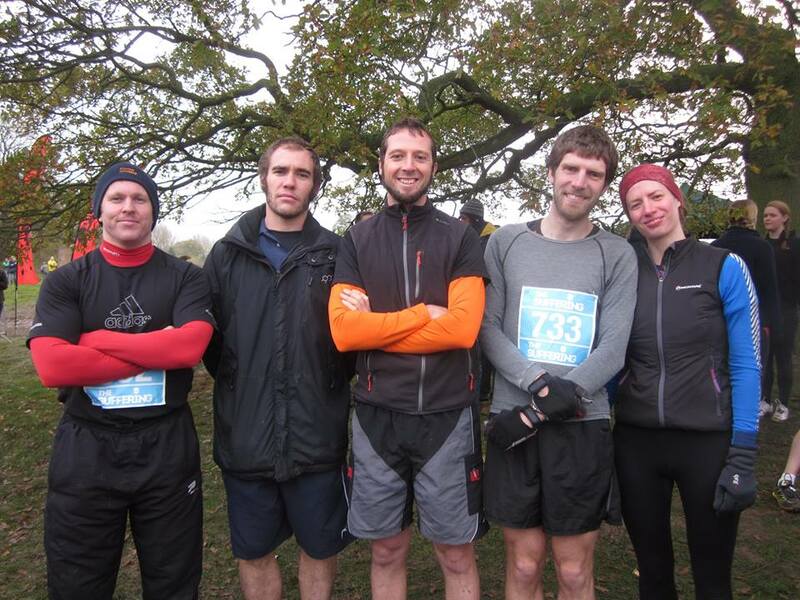 As I had entered us, Gina and I found ourselves in with the ‘Elite’ runners , with Pete and Will starting in the second wave 15 minutes later. 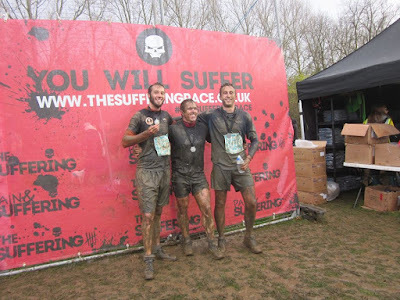 There was a short sprint from the start before we dived under the first obstacle, crawling under the netting through the mud, Pete and Will shouting encouragement at Gina and abuse at me. This served to spread the runners out before we set off across the field and through the woods. We were soon into a selection of what looked like horse-jumps to go either over, under or through. One thing which sets this race apart from the many similar ones is that the marshals are all army people of one sort or another and can pounce on any runner at any time and demand various numbers of press-ups, sit-ups, squats, burpees or whatever else takes their fancy. Those of us near the front were immediately singled out, I think to stop us getting too far ahead. 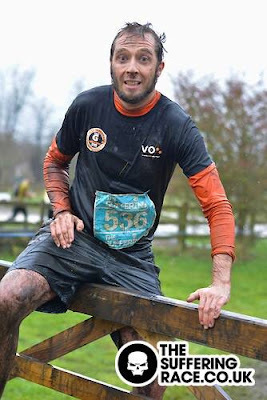 I was somewhere at the back end of the top-20 at this point and so had to do my fair share of press-ups before I was allowed to cross through the pond and set off back into the woods. It was rather difficult to keep any sort of speed up while running along a deep, narrow ditch and dragging myself out of various deep pits on the ropes, pausing only to complete a dozen press-ups, but I managed to maintain my position. I lost a few places at the jerry-cans at the top of the hill. Bike racers aren’t renowned for our upper-body strength and so trying to run while carrying a jerry-can full of water and then heaving it over a wall before scrambling up and following it over wasn’t going to go well for me. From there we launched ourselves down a properly steep hillside, made extremely slippery by some wet plastic sheeting. 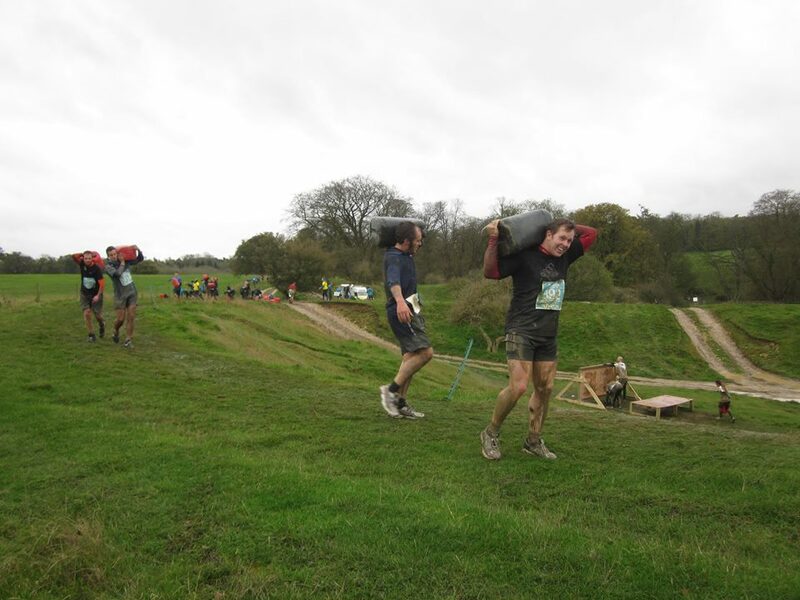 I hit the straw bales at the bottom in a tangle of limbs with my fellow competitors and, after the required number of sit ups, set off back up the hill. Pete and Will missed this section, which was one of the most fun, by the time they got there it had been closed to allow the medics to extract a broken body from the straw at the bottom. The part of the event which I found the hardest was at the bottom of the next hill. After the required number of burpees I collected another jerry-can and dragged it down to the pond at the bottom, through the water and then up the steep bank under the netting. With loud and vociferous voices shouting at me to “Get it over your head!” “Higher” “HIGHER!” I struggled back up the hill with it to the far side, put it down and then launched back into the pond and out the other side, my arms and shoulders stinging, before emerging through the nets on the other side to complete yet more burpees. I can’t recall every obstacle in detail, and I’m pretty sure that you wouldn’t want me to go through them all one by one, I probably go on a bit too much as it is. Probably the hardest mentally was the zigzagging up and down the very, very steep hill for what seemed like hours and hours and hours. Basically this was a really steep embankment which we made our way along by running up and down, up and down, up and down. It was nice to be able to see the leaders again until I realised despite how close I was as the crows flies just how far away I was as the pig walks. I am trying to introduce a new phrase to the language to express something which travels much less directly than airborne members of the corvidae family, I wonder if it will catch on? I could actually do the running bits reasonably well, far better than anything where any strength was required, and made up quite a few places here. By the time we eventually finished zigzagging and climbed the fence into the nettles I was at the back of the top-ten. The nettles and the following bog (I have no idea what was in there, and hate to think, it stank to high heaven) were followed by yet more opportunities for me to display my total lack of any upper body strength, running yet more zig-zags up and down a hill, this time with the castle wall at the top and a pair of old car tyres to carry. They can get quite heavy after the first few hundred yards. 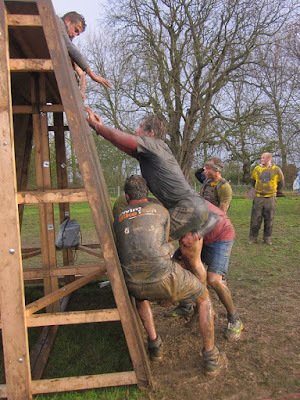 There were also the monkey bars, something with which I struggle at the best of times, never mind over an hour into a race. The marshal there informed me that the penalty for failure was 50 press-ups. I knew I wasn’t going to make it and so rather than waste any effort trying I just got down and paid the penalty straight away. More ditches, more mud, more water and many, many more press-ups, sit-ups, star-jumps and burpees later the finish line eventually came into sight. This was most welcome, having not run for ages I was knackered and my arms and shoulders were really aching, they certainly weren’t used to that effort. I was also soaked and freezing cold. This posed a bit of a problem. I was in 9th place, and quite keen to hang on to it. The guy in front was long gone but the guy behind was only about a minute back. I tried the first wall in vain again. And again. I had no choice but to just stand and wait for the man behind to catch me up. He didn’t take long, and could immediately see the problem. We worked together, he lifted me up, I climbed onto the top of the wall, reached down and helped him up, then we both jumped down and ran to the next one, repeating the process again and again. The thought had occurred to me that on the final wall I could just leap straight down and run for the line, abandoning him on the far side and taking the place, but I didn’t quite have the heart to do that and so I helped him up for the last time, we jumped down together and ran for the line, finishing just after the netting where we had started. 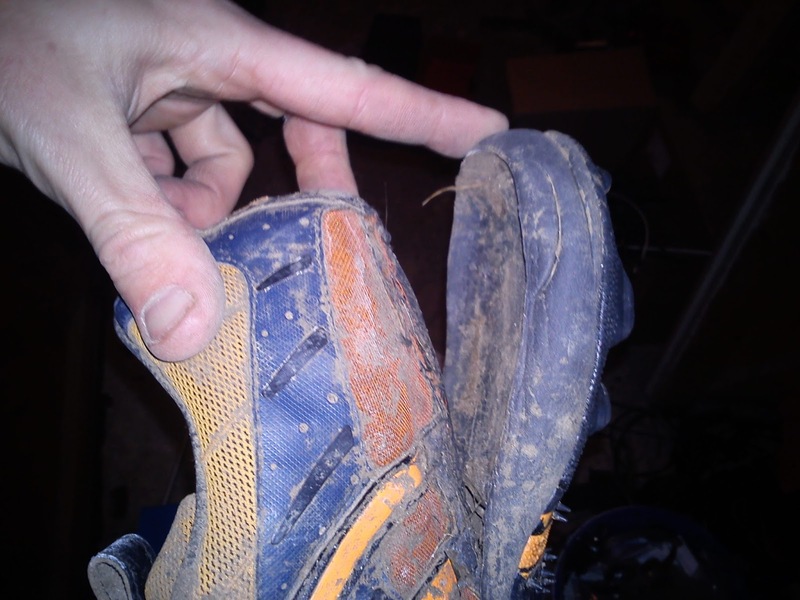 I might have been slightly quicker had this not happened to my shoe. wasn't slowing me down that much and so I can't really use it as an excuse. That was without doubt the slowest 10k I have ever done, and not only because it was actually a lot longer than the 10k they had promised us, probably nearer to 10 miles. 1hr46min might look quite slow, but I was really pleased to cross the line in 9th, although this then became 17th once they had counted the times from the other groups, 300 runners in total. Will was 22nd, Pete 57th and Gina a very impressive 8th in the girls. Despite everything it had been surprisingly good fun. I had brought a change of warm clothes, all kinds of lovely warm things, and a flask of hot chocolate which were waiting for me in the back of my van. The only problem was that Faye, Pete’s wife, had the keys for safe keeping and was nowhere to be found, she was somewhere out there on the course cheering him on. It is amazing just how cold you can get when you stop racing. I had thought I was cold before but this had definitely moved up a level or two, the biting wind now really hitting home. I searched hopelessly for Faye before deciding to head back to the finish to take shelter in the marquee which, with it’s two open sides, just served to funnel the wind through it at an ever increasing speed. The others had finished, had a shower, got dressed and warmed up before they eventually found me huddled in a corner under a space-blanket which someone had given me, blue with cold, shivering uncontrollably and not really able to talk. I was still shivering when we got the pub. for everyone and slowing but surely freezing to death.